Amazon Music Unlimited – 3 Months for 99¢! 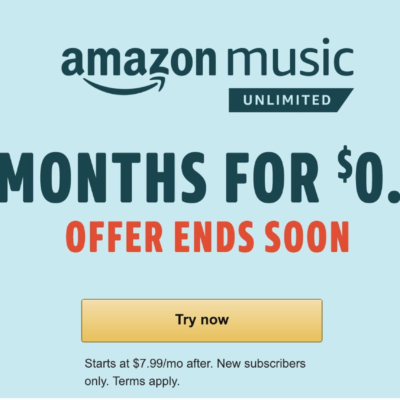 Amazon is offering a 3 month trial to their Music Unlimited service! Normally $7.99 per month or $79 per year for Prime members, or $9.99 for Prime Members, your first 3 months are 99¢! This is Amazon’s new streaming plan, which offers more choices than their regular included with Prime plan, including new releases. They also have a special plan for your Echo and a family plan! If you’re curious about the differences in the subscriptions, Amazon has a handy dandy comparison chart! While there isn’t a unified catalog of what’s currently available with Music Unlimited, you can search Amazon for a song or album and it will let you know if you can play it. Any song, anywhere! Tens of millions of songs with new releases from today's most popular artists. Listen ad-free with unlimited skips. Download for offline listening.